Process connection 3/4", 1", 1.1/2"
We are leading Manufacturer of Push Button Capacitance Type Level Transmitter and our product is made up of good quality. Radix make Capacitance Type 3 wire Level Transmitter comes with non insulated probes for non conductive liquids or PTFE Teflon insulated probes for Conductive Liquids. 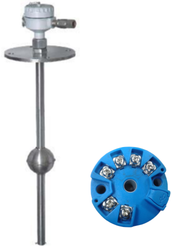 It is compact device for continuous level measurement of non aggressive liquids (without solid impurities) in non pressurized vessels, reservoirs, borewells, sumps & tanks. Available in External as well as Internal mounting option. Radix ultrasonic level transmitters are widely used to measure and control level of solids and liquids or distance of any objects. 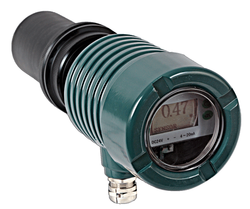 Ultrasonic level transmitters can provide level monitoring of an entire system. Model code: ULT202, ULT212 : 0.4m ~ 10m for liquids. Capacitance level transmitter is a most reliable instrument where continuous level monitoring is required. It can be used with PLC, DCS, SCADA & Controllers. Guided wave Radar level transmitter works on the principle of time and travel (TDR). Radar wave travels at the velocity of light. The flying time is converted into level signal via the electronic components. The probe emits high frequency wave pulses which travels along a cable probe or a rod probe. When the wave pulse reaches the medium surface, it will be reflected and received by the receiver,and then the distance signal will be converted into level signals. 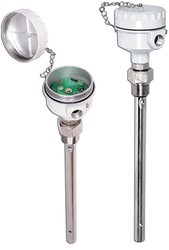 Float guided level transmitter is a most reliable instrument where continuous level monitoring is required. It can be used with PLC, DCS, SCADA & Controller. Intrinsically safe to Ex ib Gr IIA-IIB T6 (with zener barrier 24VDC / 110mA) Application Process Fluid (Options - Water, RO water, Medicinal liquid, Diesel, Hydraulic Oil,Lube Oil, Petro Chemical, Acid, Milk, Dye Chemical, Hot water,Propane, methanol, alcohol etc. Guided wave radar transmitter RLT211 Series is a non contact type Level transmitter works on the principle of time and travel (TDR). Radar wave travels at the velocity of light. The flying time is converted into level signal via the electronic components. Radix designed and manufactured state of the art Level and Temperature Transmitter for simultaneous Level and Temperature transmission(4-20mA). This sensor has the range of up to 480mm and can measure temperature upto 100 °C. It has PT-100 RTD for that purpose. Available in various Process connections like Flange, threaded and Triclover type. Enclosure options can also be explored. Process Connection Enclosure options available . Looking for Level Transmitters ?